When I bought the TinyFPGA-BX board, I thought it would be an opportunity to play a little bit with FPGA, learn some Verilog or VHDL. But when I discovered that it was possible to have a RISC-V CPU on it, I knew I had to run Ada code on it. The RISC-V CPU in question is the PicoRV32 from Clifford Wolf. It is written in Verilog and implements the RISC-V 32bits instruction set (IMC extensions). In this blog post I will explain how I added support for this CPU and made an example project. More than a year ago I wrote a blog post about building an experimental Ada compiler and running code the first RISC-V micro-controller, the HiFive1. Since then, we released an official support of RISC-V in the Pro and Community editions of GNAT so you don’t even have to build the compiler anymore. For the run-time, we will start from the existing HiFive1 run-time and change a few things to match the specs of the PicoRV32. As you will see it’s very easy. Once all the changes are made, it is time to build the run-time. First download and install the Community edition of the RISC-V32 compiler from adacore.com/download (Linux64 host only). This is it for the run-time. For a complete view of the changes, you can have a look at the commit on GitHub: here. Now that we can compile Ada code for the PicoRV32, let’s work on an example project. I wanted to include a custom Verilog module, otherwise what’s the point of using an FPGA, right? So I made a peripheral that controls WS2812 RGB LEDs, also known as Neopixels. The hardware/software interface is a memory mapped register that once written to, sends a WS2812 data frame. To control a strip of multiple LEDs, the software just has to write to this register multiple times in a loop. Then an HSV to RGB conversion function is used to implement different animations on the LED strip, like candle simulation or rainbow effect. And finally there are button inputs to select the animation and the intensity of the light. Both hardware and software sources can be found in this repository. I recommend to follow the TinyFPGA-BX User Guide first to get familiar with the board and how the bootloader works. Feeling inspired and want to start Making with Ada? We have the perfect challenge for you! 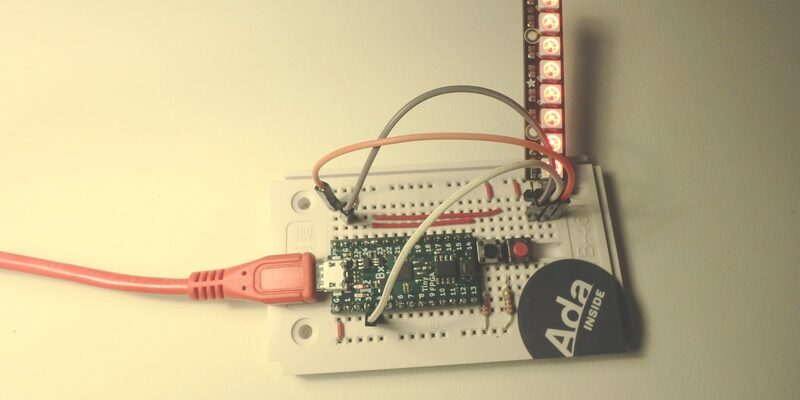 The Make with Ada competition, hosted by AdaCore, calls on embedded developers across the globe to build cool embedded applications using the Ada and SPARK programming languages and offers over €8000 in total prizes. Fabien joined AdaCore in 2010 after his engineering degree at the EPITA (Paris). He is involved in real-time, embedded and hardware simulation technology. Maker/DIYer in his spare time, his projects include electronics, music and woodworking.